London-based fans of Formula 1 racing are in for a treat today as the Regent Street F1 parade takes to the streets at 6pm. There is a real sense of excitement in the air around central London today. My office is at Piccadilly Circus and today is the day that Formula 1 comes to town! F1 cars will be parading (as there really is no racing) around the area (basically Regent Street and Lower Regent Street) from 6pm tonight. As I went to buy my lunch there were already people taking up their positions. The roads are being closed, the barriers put in place and the inevitable advertising signs going up. Jensen Button and David Coulthard are among the current F1 drivers taking part. 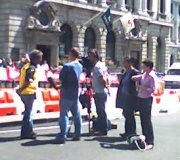 Nigel Mansell is driving for Jordan and I saw team boss, Eddie Jordan, being interviewed (left) on Lower Regent Street while out walking. I just need to decide what time I am leaving to get a view.